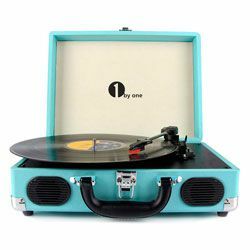 the weight of the record players in the most affordable price segment is usually less than 8 lbs. 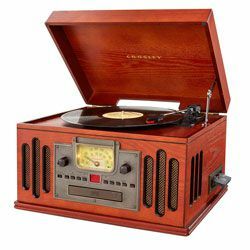 So, those are some of the main features of the vinyl players in the most attractive price range. 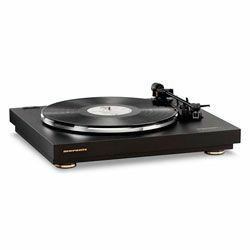 I have selected top six of the best turntables, so you could pick out the best record player under 100 dollars. Read our article to be aware of their features, advantages, and disadvantages. The PS-LX300USB by Sony is a turntable with a sleek design. It looks moderately simple and minimalist, so it will fit both retro-style and high-tech interiors. The primary material used for the cabinet is durable black polycarbonate. A transparent lid with a dark shade is provided to prevent dust accumulation, and also received a lifting mechanism and the possibility of dismantling. 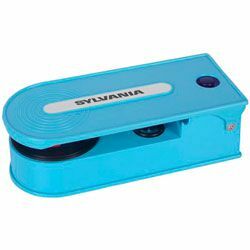 This unit is equipped with a rubber mat, speed selector, 45 RPM speed adapter and a pickup mechanism. It is noteworthy that the needle is protected by a special visor, which must be raised before playback. The presence of a USB connector allows digitizing any composition. You only need to synchronize the player with a computer and use the Sony Sound Forge Audio Studio LE software. On the front side, along with the manufacturer's logo and the model name, you can find four control buttons: “Start”, “Stop”, “Speed Adjustment” and “Head Lift”. The disk rotation is performed by a DC motor with a belt drive. The turntable has the S-shaped tonearm with a diamond needle. 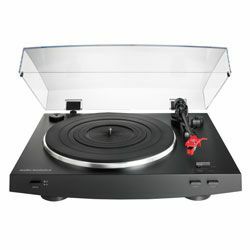 The Sony PS-LX300USB is potentially the best turntable under 100 dollars in terms of its simplicity. It has a sustained style and advanced equipment that together provide a decent playback quality. In my opinion, it can be suitable for original sound lovers. The PS-LX300USB has a fully automated playback process. The high-quality belt drive absorbs the vibrations of the motor, so that they are not transmitted to the needle. The player has a very short audio cable. The Jensen JTA-230 is a three-speed record player with modern features. This is a very versatile player, which offers more than its direct competitors for the minimal price. Due to its small size (13.4 x 13.8 x 6.4 inches), this is a portable device that you can take with you to a friend for quick listening — the internal speakers allow playing music without external equipment. Its USB port will also allow you to connect your mp3 player and copy songs from your recording to an audio file on your smartphone or iPod. The auxiliary connector provides the possibility of reproducing audio content from an electronic device. If you aren’t completely satisfied with the internal speakers, you will always have the opportunity to connect some external amplifiers and speakers through its RCA output. Despite the fact that the built-in speakers do not break the windows, its sound power will be quite enough for personal listening or with a couple of friends, especially in a small room. Thus, although you cannot use them for parties without connecting any larger amplifiers or speakers, the sound quality fully corresponds to the price. The Jensen JTA-230 is one of those entry-level turntables under 100 dollars that will suit the beginners who are still not sure that they want to spend a lot of money on high-quality audio equipment. The turntable not only reproduces vinyl records, but also able to separately act as a speaker. The JTA-230 has a possibility of the tone and pitch adjustment. The turntable’s assembly is hardly durable — the material and parts create the feeling that the product may quickly suffer from wear. The ION Audio Air LP is a record player with the automatic lifting and lowering of the tonearm, as well as an automatic start of the plate rotation. The unit is made from a combination of matte and glossy plastic, distinguished by the practical performance properties. The presence of a rubber mat prevents the plate from sliding on the supporting disc. The RCA connectors and a traditional 3.5 mm jack help to expand the connection capabilities of the player. There is another outlet for wired headphones on the frontal plane of the Audio Air LP, so you can move the turntable closely to the wall. The ION Audio Air LP provides the opportunity to listen to recordings wirelessly, sending sound to Bluetooth speakers or Bluetooth headphones. 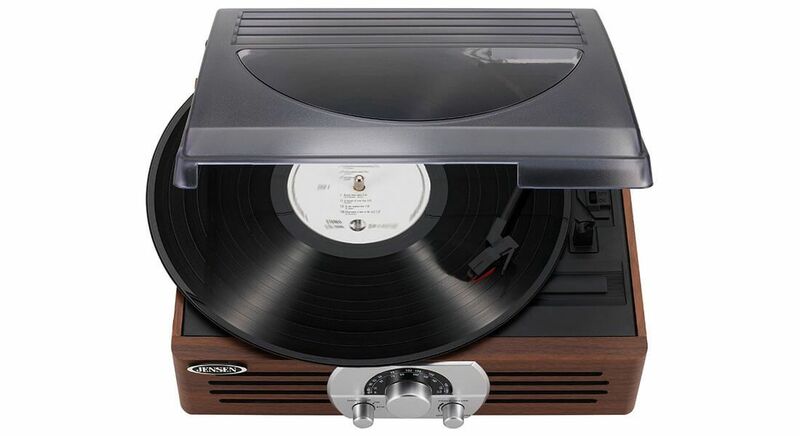 So even being away from the player you can listen to the original vinyl sound with the traditional creaking sound that this turntable is able to offer. 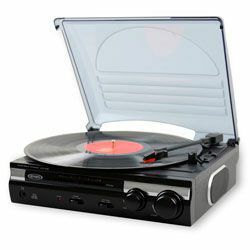 This record player can be connected to a computer via USB, which will allow you to transfer your favorite songs and concerts to the digital format with the help of a proprietary app. 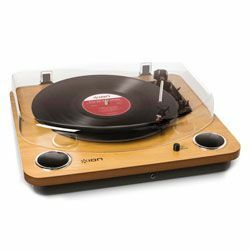 The ION Audio Air LP is among those record players under 100 dollars that combine a universal design, relevant equipment, and the affordable value. In addition, the player’s operation doesn’t require any additional skills from an inexperienced listener. 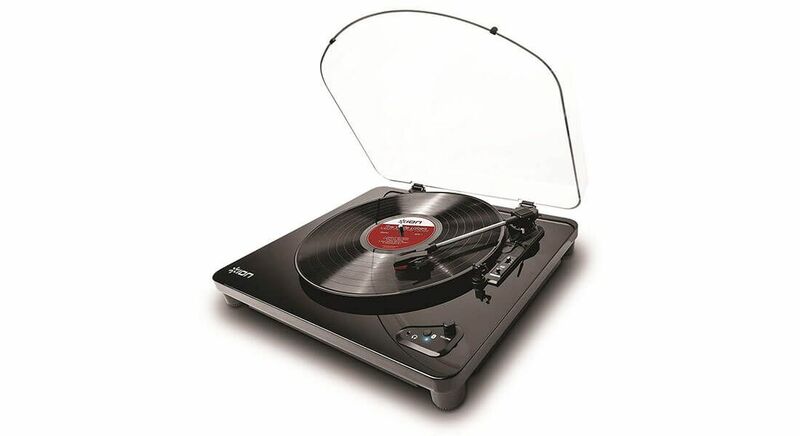 The JTA-230 is one of the few budget devices that support 78 RPM speed. Its substantial weight (10.75 pounds) implies the quality components. The mechanics of the tonearm lift will probably fail after the prolonged use. 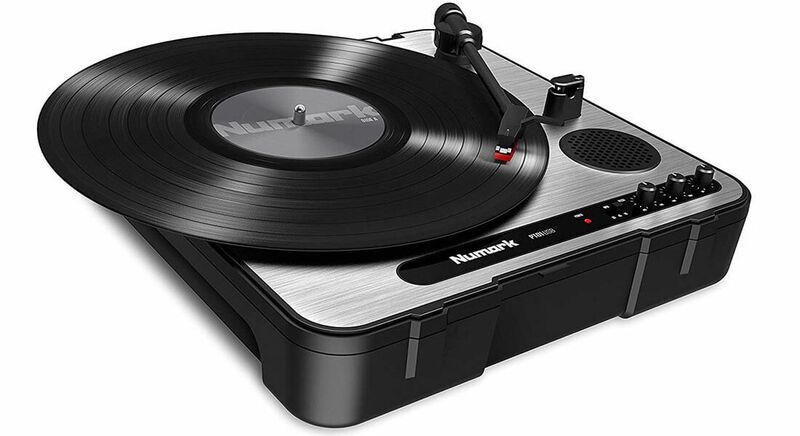 The Numark PT01USB is a portable vinyl player with the possibility to convert vinyl records to WAV or MP3 format. This player can be powered from a power outlet or from the batteries. It also has a protective cover, a transport handle, and an integrated speaker for maximum mobility. You won't need any special drivers to connect the PT01USB to any Mac or PC computer through the USB interface and transfer your music from vinyl to a hard drive. The included software allows importing audio recordings to a computer quickly and easily. The line outputs with the RCA-connectors will allow connecting the player to a home stereo system, as well as to a DJ installation. Thus, the PTO1USB can perform as a standard player/recorder. The spindle speed selector offers the ability to change the speed playback within 10% to optimize the sound of your tracks. The PT01USB is not just an advanced tool for converting vinyl records to a digital format. 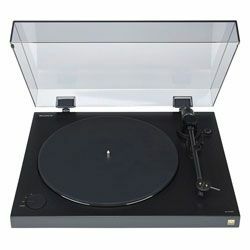 It is also one of those record players under 100 dollars that are suitable both for DJing and for a home stereo system. The PT01USB has a 1/8" line input, thanks to which it’s possible to connect other audio sources to the turntable. The turntable supports the “plug and play” system for the easiest setup. The player is compatible with plates of all the standard sizes up to 12-inch. The metal axis of the disk doesn’t rotate, so you need to monitor the position of the plate carefully. The Feir tp204 can the best $100 turntable in terms of its portability. 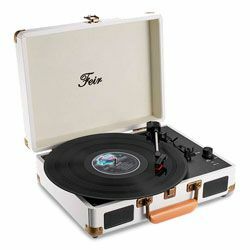 The turntable also provides durability as it goes in the white suitcase that keeps everything in place during transportation, and also provides a convenient carrying handle. 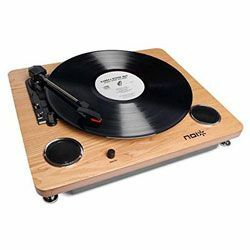 One of the notable features of this vinyl player is its ability to play almost any type of records. 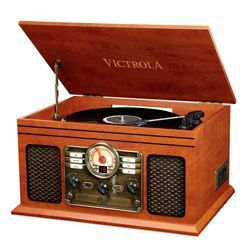 With the possibility to play at 33, 45 and 78 RPM and without need for an adapter, this player won't just be able to play any recordings but also can do it without any extra costs or problems. 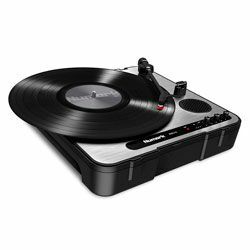 Moreover, you can use this portable turntable as an audio source for hooking up to any other audio equipment for playing via 3.5 mm output jack and the RCA output. The USB port on the back side of the device provides the opportunity to hook up the device to a smartphone. 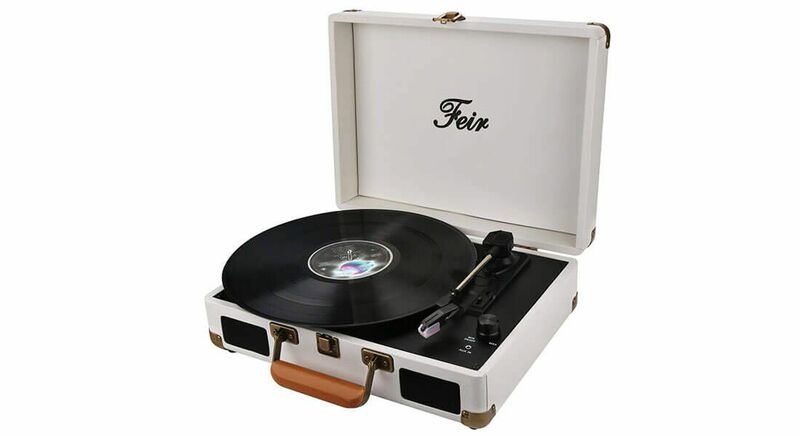 The Feir tp204 is a music player and turntable in one for vinyl novices. It is portable and comes with 3 speeds. It has the built-in speakers, so you can listen to music through them or use the headphone jack. Despite its affordable price, the cabinet of the tp204 is made of solid wood. The turntable goes with a balanced tonearm. The player has a rather thick platter. The JTA-222 by Jensen is a record player that goes in the antique-style wooden case that gives it a classic look. 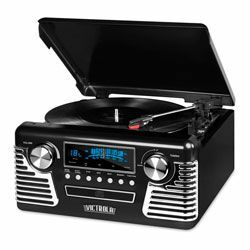 It is a three-speed vinyl player with AM/FM stereo radio equipped with two built-in front speakers. Like all the other vinyl players in this price segment, the JTA-222 has heavy tracking. It helps to prevent the needle slipping, but at the expense of deterioration or impairing your records. The stylus on this player is removable, and a spare needle is also included in the kit. The turntable has a straight tonearm that is made from plastic. 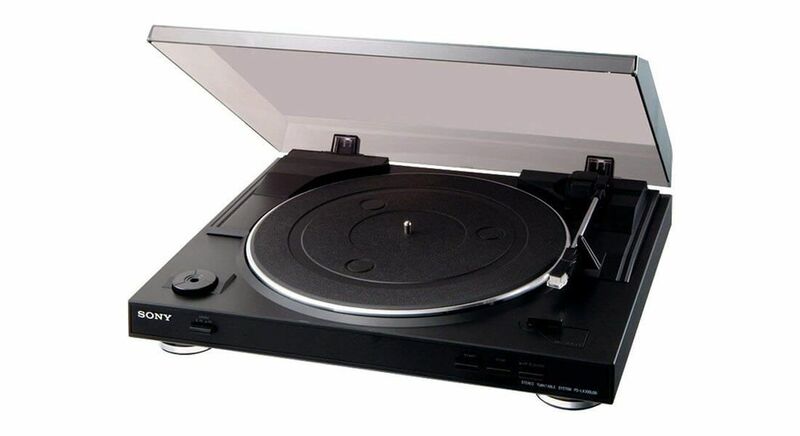 As most of low-end vinyl players, this unit has no additional adjustment functions, such as counterweight, ramp protection and height regulation, and none of its parts can be upgraded. If you are not an audiophile or a professional, but just need some device to play your vinyl records collection, you should definitely take a closer look at the JTA-222. This turntable is able to give you the classic old style analog sound. The kit includes a 45 RPM adapter for 7-inch records. It has the ability to connect external speakers. The operation of this device is largely manual — it has an auto-stop function but doesn’t have an automatic return.